Creating a Bed file with the start and end sequence of each of the alternative splice variants and the number of exons each one has. 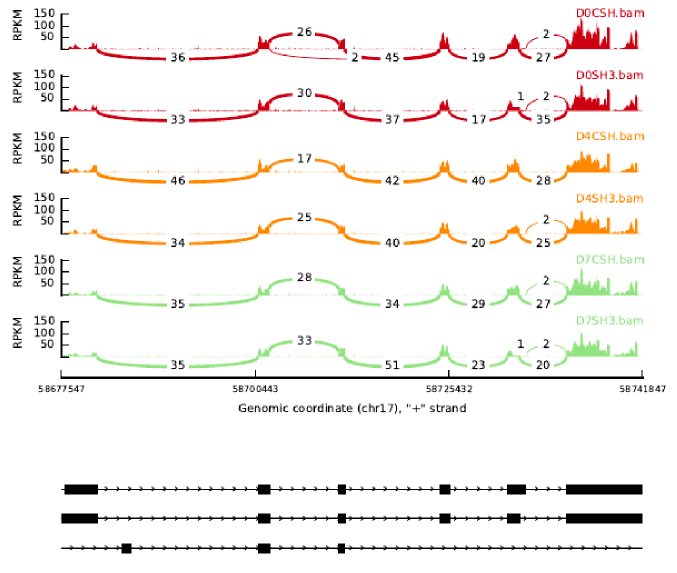 When utilizing bedtools and CoverageBed this results in identical read counts for each transcript due to the large overlap in chromosomal location. I have additionally looked into http://miso.readthedocs.org/en/fastmiso/#gff-event-annotation Miso and the gff-alternative event annotation format. This seems like it may work though I do not understand how to create such a file. I have looked into the premade gff annotation files made my Miso http://miso.readthedocs.org/en/fastmiso/annotation.html but when I searched for the specific variant of my gene. It showed up in multiple entries, with none of them matching the chromosomal location of the gene I am looking for. I would really appreciate some help!!! Do you want raw counts or normalized expression values will do? If the latter is fine then you can use Cuffquant & Cuffnorm to get isoform expression of a gene. It will not give you raw read counts but will give normalized expression values & FPKM values. To get raw counts, DEXSeq may be your problem's solution. The issue I am running into which both cuffquant and cuffnorm also have is how to create an annotation file, either BED or GFF because these file formats only require the chromosomal location of the gene. In my case the different alternative splice variants of this gene all overlap. So with only that information the reads between all the alternative splice variants will be identical. Is there a away around this? 1) Use GESS to get all expressed isoforms from your experiment (your aligned BAM file). You can find exon-skipping events for individual BAM files. If you want to check isoforms in the whole experimental condition, you can merge all BAM files from one condition and find the exon skipping events for corresponding conditions. Output: GTF file with exon-skipping events. 2) Index the GTF files obtained from GESS for individual BAM or for each condition. 3) Run MISO on indexed GTF files. This will give you results for individual genes and their score (Ψ calculation) for each of its isoform (or skipping events). 4) Plot results for individual gene (which plots all possible skipping events or isoforms) using sashimi plot from MISO. NOTE: Edit 'sashimi_plot_settings.txt' file to configure your samples and provide the path to 'sashimi_plot_settings.txt' in the command line. I hope this will help you finding the alternative splicing events. Please let me know if you need any further help. Thank you very much for your reply. I will try this. I have a small question, if I already know what alternative splice I want to target including its sequence and location can I start at step two, and if so how can I create that GTF file? My suggestion is to better run all the above steps. And later you can check whether your alternative splice site has come as significant in the above analysis. Or if you still want to run you can convert your alternative splice events (Gene with all its isoforms) as standard GTF format (http://www.ensembl.org/info/website/upload/gff.html#fields) and start with Step 2. "Exception: Cannot find file /home/ubuntu/SAMPLE1/miso_out/genes_to_filenames.shelve. Are you sure the events were indexed with the latest version of index_gff.py?" Exception: Event ENSGXXXXXXXXXX.1 not found in pickled directory /home/pranavubuntu/SAMPLE1/miso_out. Are you sure this is the right directory for the event? (I actually plugged in the gene I am targeting in the Xs.) What is causing this error? Can you please post your 'sashimi_plot_settings.txt' file? Because I guess you have not edited the file to configure your samples. Sorry I forget to mention that in the above steps. This is './test-data/bam-data/heartWT1.sorted.bam' test datasets for sashimi plot. # Hex colors are accepted too. None of my folders are of the form "ENSGxxxxxxxxxx.1" I am unsure whether GESS saved its indexed files as such. And 'ENSGxxxxxxxxxx.1' is just a example I gave. It might have different name depends on the GFF file (may be named as chromosomal locations). I'm trying out GESS on my set of data. They are mouse mm10. I used JAGuaR (Junction Alignments to Genome for RNA-Seq Reads) for alignment. I have installed all required packages. When I run GESS i get the following warning: "/Library/Frameworks/Python.framework/Versions/2.7/lib/python2.7/site-packages/Bio/Seq.py:341: BiopythonDeprecationWarning: This method is obsolete; please use str(my_seq) instead of my_seq.tostring(). BiopythonDeprecationWarning)"
"Traceback (most recent call last): File "/Library/Frameworks/Python.framework/Versions/2.7/lib/python2.7/site-packages/gess/GESS.py", line 122, in <module> main() File "/Library/Frameworks/Python.framework/Versions/2.7/lib/python2.7/site-packages/gess/GESS.py", line 64, in main global_data = GESS_patternScanning(options,global_data) #### File "/Library/Frameworks/Python.framework/Versions/2.7/lib/python2.7/site-packages/gess/impl/SkipPatternProc.py", line 168, in GESS_patternScanning global_data = skipPatternProc.process() File "/Library/Frameworks/Python.framework/Versions/2.7/lib/python2.7/site-packages/gess/impl/SkipPatternProc.py", line 35, in process patterns = self.getSkipPattern(spliceGraph) File "/Library/Frameworks/Python.framework/Versions/2.7/lib/python2.7/site-packages/gess/impl/SkipPatternProc.py", line 74, in getSkipPattern chrid = component.split(':') TypeError: 'set' object does not support indexing"